"4 GREATEST GOLF CHAMPIONS AT IMPACT POSITION"
The passing of a year can bring a marked change in the weather and the surrounding environment. The four seasons — winter, spring, summer, autumn — can vary significantly in characteristics, and can prompt changes in the world around them.
" Not just that, but it will affect also your Golf Game." JIMMY BRANDT my student on TV Show and Winner of the BIG BREAK " MYRTLE BEACH"
When was the last time you did all these checking points? Ji Eun Baik, (JB) a 2017 college graduate from Mississippi State University, is my newly-recruited female golf professional student who started working with me in the beginning of 2018 and now has 2 wins under her belt and has made her debut in the LPGA tournament as of August 2018. 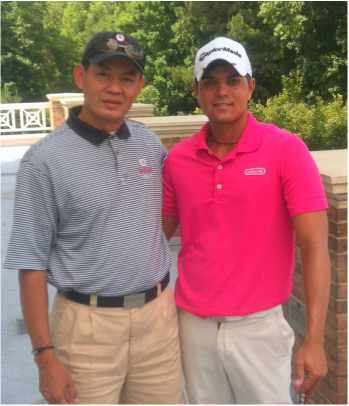 Sath has so much knowledge stored in him that even just one or two lessons will make any golfer tremendously better. He is hilarious, kind, and very hard-working, so I respect him very much as a person and as my coach. I can never thank him enough for all he does for me on and off the course. GEORGIA WOMEN'S OPEN "JULY 2018"